This section of our website is a place for our leaders and team members to share stories from our journeys as we implement our great work here in NYC and in new destinations across the country. The ultimate journey is one that we have been on together for over 10 years – to create healthier places for children to learn and grow. 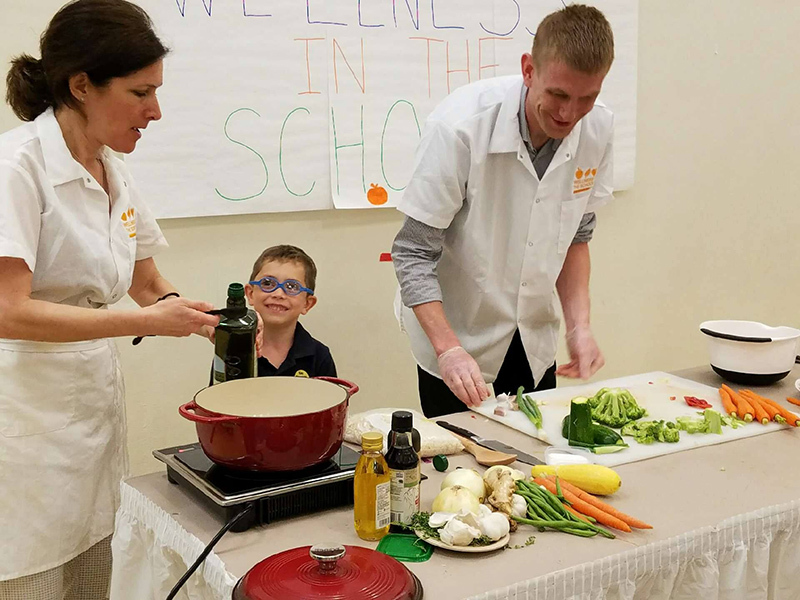 As we do this, we know we are part of a dedicated community working to combat the childhood obesity epidemic. We know that schools are such an important place to start. We know that schools should be examples for good health and positive play. We are helping school leaders set a healthy example – one school, one city, and region at a time. I think it is quite appropriate that our first entry begins with my hometown, Key Biscayne, Florida. Full disclosure: this particular “on the road” was not exactly a work trip. I did meet with some of our new partners in South Florida, but this trip was during my son Will’s school break to spend some time in the sun. My youngest, Zane, was not on break, but he joined us because we believe that playing sports and riding bikes is just as important as third grade math. Sadie and my husband stayed behind (someone has to represent at school and work). As I rode my bike from my dad’s home on Key Biscayne to my elementary school, showing the kids my childhood route (they rolled their eyes), I realized that there were far fewer bikes on the sidewalks and far fewer bikes parked in the elementary school lot than when I was a kid 40 years ago. As we biked around, I reflected on my elementary school years (yes, I remember them like they were yesterday). My favorite subject was Physical Education (PE); and achieving greatness on the Presidential Physical Fitness was my ultimate goal. Remember the Presidential Physical Fitness test? I did set the record for the arm flex hang in 2nd grade (102.8 seconds) and in the 50-yard dash in 6th grade (6.3 seconds). I still wonder if Glenn Peroni was a bit delayed on hitting those two blocks together at the start, hence causing our beloved Mr. Foster to get my start a bit late from the finish line. I didn’t argue then, though. Glory days . . . 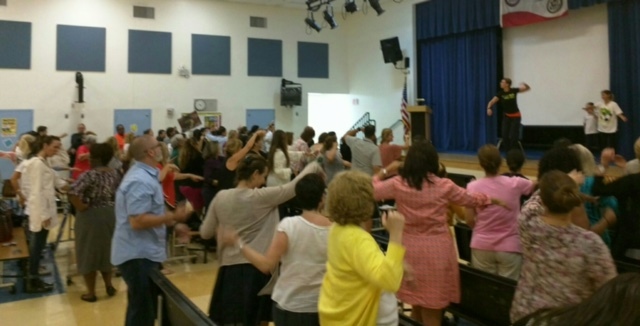 WITS Coach for Kids Director Wendy Siskin leads a Fit Bit training for teachers in South Florida schools. Key Biscayne, a small town, produced many college athletes and even a few pros – probably not unlike many small towns in the 70’s. But that was back when PE was everyone’s favorite subject and when we actually had PE each and every day. That was back when preparing for a competition or a race was treated like the sharpening of #2 pencils or the eating of a good breakfast for the city-wide tests of today. That was back when kids biked or walked to school and lunches were made from scratch and we drank only water to hydrate. Really, what kid loses enough electrolytes in a one-hour soccer game to warrant a 32 ounce bottle of a “sports drink” (and the 56 grams of sugar that comes with it)? So, WITS will begin work at Key Biscayne Community School this month – in my elementary school. The story of how we landed there is a good one, and it is not because I asked. The head of the local foundation, Melissa White, was approached by a donor with the charge to create healthier schools. Melissa did her Google research and came upon WITS and me. When she saw that her former camp counselor was now leading a national non-profit, she looked no further. There was also local demand – a (failed) mandate in the state Legislature demanding daily recess in schools, and a Change.org petition launched by a group of local moms demanding the same. And, it didn’t hurt that my father is a long time Key Biscayne resident and a big fan and supporter of Melissa’s (like he is to many kids with whom we were raised). Key Biscayne has become an affluent community and we insisted on bringing our work beyond the community, to several other schools across South Florida, where there is even greater need. WITS has always focused our work in high poverty communities because we know that poverty and obesity are linked, yet we also know that all kids deserve healthy places to learn. Good food and good play are not a privilege, but a right. Thanks to the help and support of Melissa, of Penny Parham (Administrative Director in the Department of Food and Nutrition for Dade County), of Mary Muldor (Director of Food Nutrition Service for Broward County) and of the Florida Department of Agriculture, we will indeed bring our work to approximately 4,000 more children and 4 more communities. We are excited and anxious to dive in and do our part to bring wellness back to these communities.